With print quality very high and prices ultra-low, what can multifunction printer manufacturers do to improve on previous models? This new HP Photosmart 7510 sets itself apart by offering a huge range of features, but it also leaves a few behind. The HP Photosmart 7510 uses five ink tanks: CMYK, plus a pigmented black for clear, waterproof text. It connects to your Mac through USB or to your home network using Wi-Fi b/g/n, and has AirPrint for printing from iOS devices. With ePrint, you can email a document to your printer from anything that can send an email, and eFax lets you send and receive faxes over the internet. The Photosmart 7510's clear, responsive 4.3-inch touchscreen and intuitive icon-driven interface makes it very easy to use, though the screen isn't a detachable tablet like last year's HP eStation. 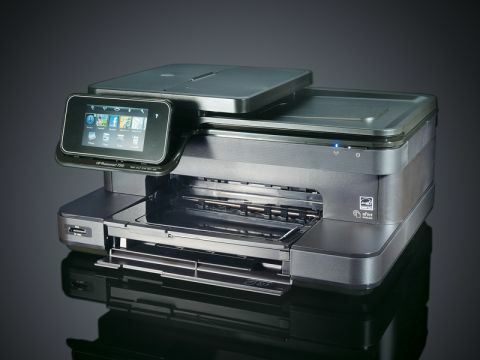 Auto-Duplex gives two-sided printing, and it also takes advantage of HP's mini-apps. You can access internet services like Facebook and Snapfish, print calendars, forms, graph paper and puzzles, check the local weather forecast and more, all direct from the printer. Additional apps are available for download. As you'd expect from an HP, the Photosmart 7510 puts in an excellent printing performance. Text is beautifully realised, and very fast considering this isn't an office printer. Our 20-page test document took just two minutes, three seconds. Default-quality photo printing is clear and vibrant, if a little banded. And with photo paper and maximum DPI settings, it's near perfect, though perhaps a little dark. Yet a few features are missing. There's a tray for prints of up to 7x5 inches, but no second A4 tray or feeder for photo paper or letterheads. There's no Ethernet connectivity, no disc on-body printing, and although you can print from SD or MMC cards, you can't use USB sticks or PictBridge. But as long as you don't desperately need any of these things, the features it does have and its stellar print quality mean the HP Photosmart 7510 comes highly recommended.